The photographs [web_mikeladze_]”01” and “46” were clearly taken in succession, as they share the same background, and the bearded figure standing in “01” is seated in “47”. Equally, the woman standing on the left in “01” can be seen standing on the right in “46”. 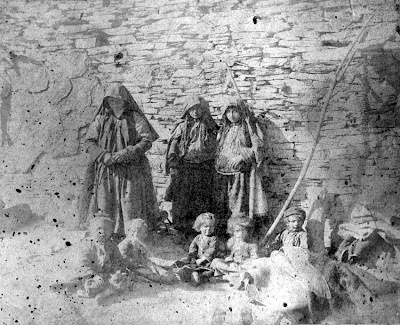 To judge from the clothes and the apparent condition of the people photographed, the predominance of wood and stone (local slate) to the exclusion of any other building material, and the steep slope which can be seen in picture “01”, these photographs were most likely taken in situ in a Batsbi village – perhaps in Tsaro or Indurta. These clues, in addition to certain technical aspects of the photographs themselves (they are most likely long exposures on glass plates i.e. were taken with an old field-camera), point to a date somewhere in the late nineteenth century, perhaps in the 1880s or 1890s. These three photographs seem to have been taken as records of Death, and the presence of a dead body in two of them is quite startling! 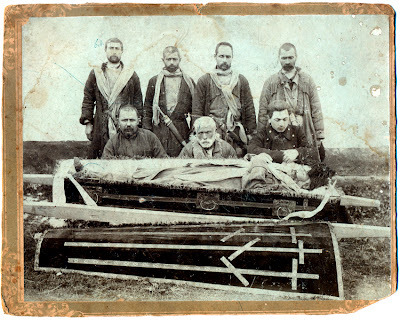 More is known about the scene in photograph “25”, as it has a detailed inscription on the back – The dead man is Ikako Utchilauri, murdered by Alexi Tsikhelishvili because he refused to lend the latter the princely sum of 3 rubles. The mourners are Ikako Utchilauri’s relatives and – somewhat surprisingly, perhaps! 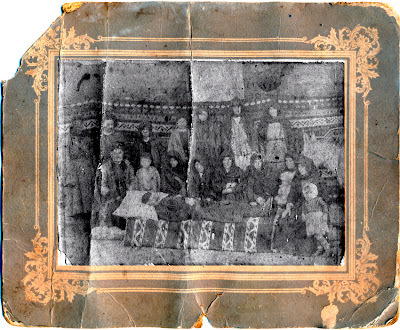 – relatives of Alexi Tsikhelishvili’s. 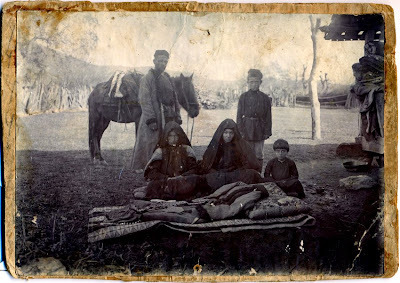 Judging from the lie of the land in the background, and from the abundance of wood and clearing, this photograph was almost certainly taken in the Kakhetian lowlands, where the Batsbis had to cut down trees to clear the land and to use the wood for their new homes. From 1803 to 1918, Georgia was a “gubernia”, a “governorship”, of the Russian empire. 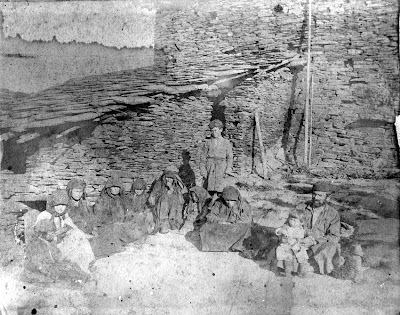 The Russian administration responsible for the Georgian province of Kakheti (and others, perhaps) carried out several population censuses during this period – in 1831, 1873, and 1886 – censuses which naturally also considered the population of Tusheti and therefore of Tsovata. The census of 1831 registered 278 Batsbi households, some 1,531 individuals (5.5 per household). According to the census of 1873, the number of Batsbis was slightly higher – some 1,571, a 3% increase. And in 1886, a total of 1,533 Batsbis were registered , representing 337 families (4.5 individuals per family). It would seem that the census of 1886 was much more comprehensive. In it we can discover that there were 49 villages in Tusheti as a whole, of which four were in Tsovata (and therefore inhabited by Batsbis): Indurta, Sagirta, Tsaro, and Etelta. The remaining 45 villages were inhabited by Georgian-speaking Tush – the so-called Tchaghma, Pirikiti, and Gometsari Tush – whose number was recorded as being 4,174 individuals representing 830 households, an average of 5 per household, and 2.7 times superior in number to the Batsbis. This data is however complicated by the fact that scientific and ethnographic data accounts for another four Batsbi villages in Tsovata: Nazarta, Nadirta, Mozarta, and Shavtsqala. However, it is believed that these villages were largely abandoned in the seventeenth and eighteenth centuries, their inhabitants moving to the other four village mentioned above. 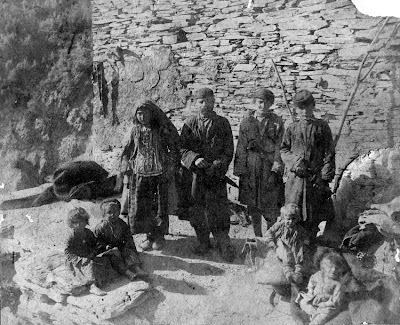 In addition to this, the migration of the Batsbis from Tsovata to the Kakhetian lowlands took place during the first half of the nineteenth century, in the 1830s - The data of the 1908 census is the first to take into account this migration, the increase in numbers reflecting the relatively easier conditions of life in the lowlands.